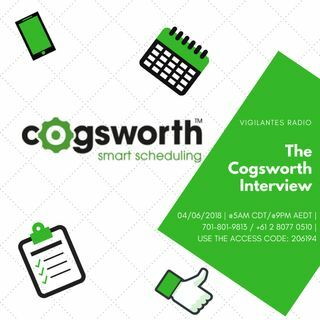 CRM Specialist, CEO & Founder of Cogsworth, Mr. Boris Gefter, stops by, Vigilantes Radio's "Inside The Biz" Series to chat with Dini about the birth of Cogsworth, Cogsworth innovative business systems, & how does Cosgworth fit in today's society of a fast-paced business life. To find out, set your reminders, it's happening! ... See More 04/06/2018 | @5AM CDT | Call in at 701-801-9813 | If you're in Australia - 04/06/2018 | @9PM AEDT | Call in at +61 2 8077 0510 | Use Access Code: 206194 | You can also hop in the mix by visiting www.onlyonemediagroup.com and slapping that "Go Live" button | Please follow our show at www.spreaker.com/onlyonemediagroup & remember sharing is caring! Thanks for your continuous support!